When it comes to managing stock levels and offering a quick, hassle-free checkout process to customers, supermarkets and retail businesses several challenges. The vast inventory and high employee turnover of the retail industry demands an easy-to-use yet feature-rich POS software that requires little or no training and is comprehensive enough to allow businesses to cater to the diverse needs of their customers. Our Supermarket POS software has been designed keeping these unique challenges under consideration, and is therefore, particularly suitable for entrepreneurs who want to maintain a good profit margin while ensuring complete satisfaction of their customers. Our Retail POS Software makes the intricate process of inventory management and stock replenishment simple and easy with its advanced stock control features. From generating purchasing orders to managing tax invoices from suppliers, the software takes care of each aspect so that you can focus your attention on the matters of strategic importance. With split billing, multi-currency support, and various other innovative features, our supermarket POS software offers a fast checkout process, which in turn improves the buying experience of your customers and makes them visit your store again. 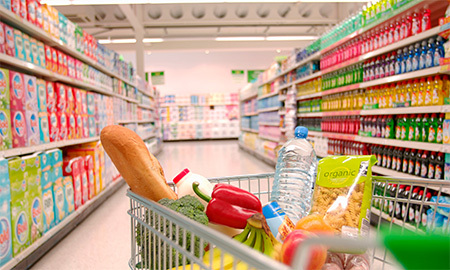 Our Supermarket POS Software allows you to analyse your trading relationship with different suppliers. You can view the number of claims against the supplier and conduct cash flow analysis to keep track of your supplier expenses and maintain lasting, profitable relationships with your suppliers. Today’s dynamic retail environment demands a POS solution that can help prevent theft and fraud. Our Supermarket POS Software ensures this with its robust identification methods and by allowing you to restrict access rights of different users. Pull new shoppers and make them come back by offering them delightful promotional offers. You can also analyse the purchasing behaviours and buying frequency of a customer to offer them pre-set discounts every time they shop from your store.